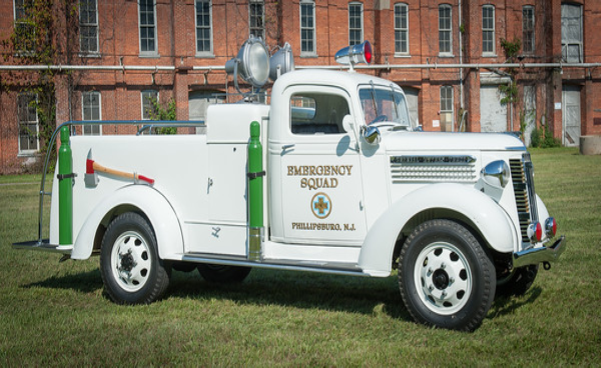 The idea of an emergency squad for Phillipsburg was born in an automobile between Washington and Phillipsburg on an evening in 1936. The four men in the automobile were Ira Snyder, Alfred Bates, Lewis Silverthorn and Charles Shappel, Jr., who was to serve as squad captain for twenty-seven years. The group was returning from a demonstration put on by the Washington Fire Department First Aid and Rescue Squad at the Washington Boro Hall, The event had been arranged by Vernon "Bab" Oakes, captain of that squad and a former fire chief. The Phillipsburg Emergency Squad was planned on their trip home. Harvey Mowder, of Washington, was the first instructor. The Phillipsburg Squad was never a part of the fire or police departments, but its original membership was drawn from those departments. Included were two firemen from each of the six fire companies and two policeman. Later the membership was increased to sixteen, and still later to thirty-five. In its early days the firehouse of the Lincoln Engine Co. was it headquarters. The membership again was increased in 1979, this time to fifty. At the end of the year, eight of the additional openings were filled, four of them by the Squad's first women members. A Junior membership was instituted in 1974 and now has an enrollment of eight.